Initially released on the Spectrum by Activision, before being re-released by Mastertronic, Xcel is described by Sinclair User as Star Trek, Space Invaders and Centipede rolled into one. Sadly the game is denied so not available for download on World of Spectrum, so I have no idea how it plays but it did garner average to good reviews upon its release and seems to have fallen into the ‘worth a look on the budget release’ category. The story goes that thirty planets were created to protect mankind, known as Sentinels. However, as is wont to happen with computers in the not-too distant future, they develop their own conscious’ and become a danger, and surprise, surprise its your mission to destroy them. According to the reviews I read, the game is essentially a blast-em’ up with a few elements of other genres tacked on. The game did make its way to the Amstrad CPC, so what stopped it from being released on the C64? Both Activision and Mastertronic released hordes of games on the C64, and if it appeared on both the Spectrum and the CPC, you’d have to guess that the C64 version was at least partially made before being scrapped. 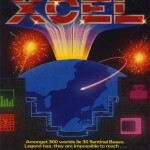 Unless we track down someone related to the game, companies involved or the programmers, known as ‘Programming Techniques’, then I can’t see how we’ll ever find out what happened to Xcel on the C64.